Steadily, the body of scouts rises higher and higher, threading its way between the cloud precipices. Sometimes, below, the streets of a village, the corner of a wood, a few dark figures moving, glides into view like a slide into a lantern and then is hidden again. But the fighting pilot’s eyes are not on the ground, but roving endlessly through the lower and higher reaches of the sky, peering anxiously through fur-goggles to spot those black slow-moving specks against land or cloud which mean full throttle, tense muscles, held breath, and the headlong plunge with screaming wires – a Hun in the sights, and the tracers flashing. A red light curls up from the leader’s cockpit and falls away. Action! He alters direction slightly, and the patrol, shifting throttle and rudder, keep close like a pack of hounds on the scent. He has seen, and they see soon, six scouts three thousand feet below. Black crosses! It seems interminable till the eleven come within diving distance. The pilots nurse their engines, hard-minded and set, test their guns and watch their indicators. At last the leader sways sideways, as a signal that each should take his man, and suddenly drops. Machines fall scattering, the earth races up, the enemy patrol, startled, wheels and breaks. Each his man! The chocolate thunderbolts take sights, steady their screaming planes, and fire. A burst, fifty rounds – it is over. They have overshot, and the enemy, hit or missed, is lost for the moment. The pilot steadies his stampeding mount, pulls her out with a firm hand, twisting his head right and left, trying to follow his man, to sight another, to back up a friend in danger, to note another in flames. But the squadron plunging into action had not seen, far off, approaching from the east, the rescue flight of Red Albatroses patrolling above the body of machines on which they had dived, to guard they tails and second them in the battle (...). But, nevertheless, the enemy, double in number, greater in power and fighting with skill and courage, gradually overpower the British, whose machines scatter, driven down beneath the scarlet German fighters. It would be impossible to describe the action of such a battle. A pilot, in the second between his own engagements, might see a hun diving vertically, an S.E. 5 on his tail, on the tail of the S.E. 5 another Hun, and above him again another British scout. These four, plunging headlong at two hundred miles an hour, guns crackling, tracers streaming, suddenly break up. The lowest Hun plunges flaming to his death, if death has not taken him already. His victor seems to stagger, suddenly pulls out in a great leap, as a trout leaps on the end of a line, and then, turning over on his belly, swoops and spins in a dizzy falling spiral with the earth to end it. The third German zooms veering, and the last of that meteoric quartet follows bursting... But such a glimpse, lasting perhaps ten seconds, is broken by the sharp rattle of another attack. Two machines approach head-on at breakneck speed, firing at each other, tracers whistling through each other’s planes, each slipping sideways on his rudder to trick the other’s gun fire. Who will hold longest? Two hundred yards, a hundred, fifty, and then, neither hit, with one accord they fling their machines sideways, bank and circle, each striving to bring his gun on to the other’s tail (...). The game of noughts and crosses, starting at fifteen thousand feet above the clouds, drops in altitude engagement by engagement. Friends and foes are scattered. A last S.E., pressed by two Huns, plunges and wheels, gun-jammed, like a snipe over marshes, darts lower, finds refuge in the ground mist, and disappears („Sagittarius Rising” by Cecil Lewis). In the summer of 1917 the S.E. 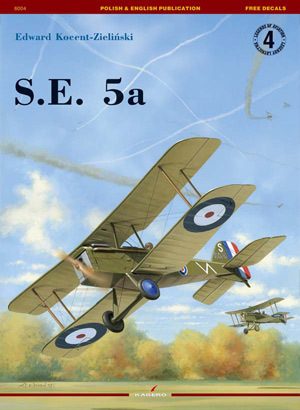 5, a new creation of the British aircraft industry, was not able to put up an equal fight against German aircraft. The too weak engine and various defects doomed it to defeat in aerial combat. However, with the course of time, the S.E. 5a version, after numerous improvements and with a more powerful engine, came to be considered the best British fighter of WW1. Thanks to its durability, and particularly the quality of the engine, the S.E. 5a was long used during the post-war years by air forces in various countries. It was used for various kind of tests and experiments. It also had contact with the Polish air force. Therefore, the history of its development and service is worthy of notice. It is difficult to determine how much Italy offered to hired airmen, but the sums offered to those employed by the Turkish government were substantial for those times. These were prophetic words, indeed, but the idea of creating a British air force was then scornfully rejected. The minister of war, Lord Haldane, told the aerial pioneers that the Ministry of War had no grounds to promote aviation, considering it “entirely unsuitable for military purposes”. This conviction changed quickly following the above-mentioned events. As a result, an aircraft detachment was created on November 1, 1911 inside the balloon battalion at Farnborough. With this regard, Cap. Cody was ordered to design the first English military aircraft. The aforementioned isolation of the British Isles and specific attitude towards it caused the advancement of the work to be slightly delayed here compared to France or Germany. The British traditionalism did not indulge the aviation pioneers, while the Red Flag Act considerably delayed the development of the automobile industry, the latter being the background for engine designers. However, just prior to WW1 Britain had a range of aircraft companies (e.g. Avro, Sopwith, Handley Page, Bristol or Vickers) pro­ducing airplanes for the air force. Additionally, French planes were imported, while the Caudron and Bleriot-Spad companies opened branch factories in Britain, which indicated that practicality made the British forget, at least in this domain, their traditional dislike of the French. – support for Sir Douglas Haig’s Expeditional Corps fighting in the mainland since April 1917. These issues could have only been resolved by developing a fighter air force to a level higher than that of the enemy, i.e. mainly the German imperial air force’s. It was no easy task. German aircraft technology was highly specialized at the time. The numerous engineers’ offices and factories achieved excellent results in both quality and quantity. Particularly the Fokker company distinguished itself, its engineers Anthony Fokker and Reinhold Platz designing ever more modern and improved constructions. The Albatros company did as well. 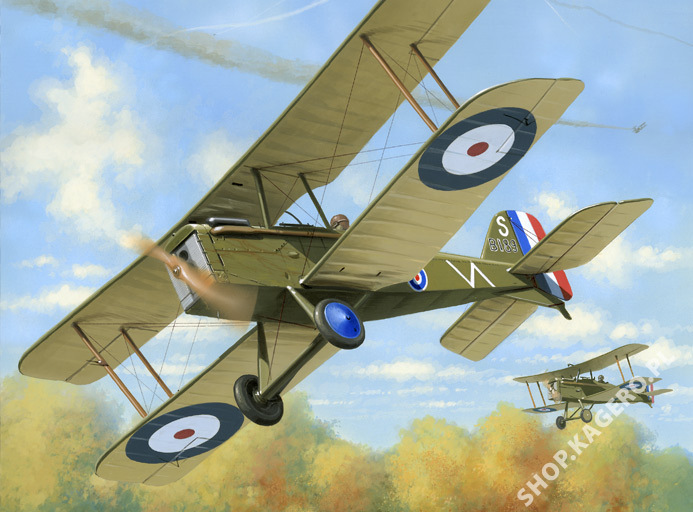 In 1916 the then best fighter aircraft with the RFC – the Sopwith “Camel” – proved worse than Fokkers and Albatroses in terms of performance and armament. The situation was becoming critical. The genesis of the design To change the state of insufficient equipment, the RFC authorities decided to introduce a new fighter to combat. It was to be of simple construction and at the same time durable, heavily armed and easily manufactured in bulk. These specs, approved by Gen. Sir Trenchard, commander of the RFC, as guidelines for the industry were made before detailed tests on the French Spad VIIC1, which was considered a better aircraft than the British models (it was produced under license at Bleriot & Spad Aircraft Works). However, taking the Spad for the model for copying or improvement was rejected on Sir W. Farren’s opinion, a member of the test team with the Royal Aircraft Factory, although such options were considered. It was decided to develop a home project that would meet the requirements. Engineer Folland, leading the factory’s design office, was the author of several successful aircraft built in the preceding years. These were the S.E. 2 and 2a in 1913 and S.E. 4 and 4a in 1914. The new team he created engineered the drawings and made the calculations for the new fighter by mid-March 1916 (while the government’s committee still worked at the factory). The aircraft was named S.E. 5 (Scouting Experimental) in connection with the names formerly used by the factory. To a certain degree, its construction was modeled on the earlier designs of the Austin AFB1 and Vickers FB16D. The S.E. 5 was supposed to be a classic ­biplane with the interplane bay wire-braced. Improvements unusual for that period were assumed: an in-flight adjustable horizontal stabilizer and a steerable tail skid (both items being later on copied from a “competition” project – the FE-10). The landing gear of quite a wide tread had sheathed rubber cords for shock absorption. The basic material for the aircraft construction was spruce and plywood. Concurrently, another, alternative fighter project was being developed. It was initially named FE-10. This, too, was a bi-plane, but of an unconventional layout. The power transmission system was housed behind the cockpit, with the tractor airscrew revolving between the cockpit and engine. This, either, was not a novel solution, for similar were used on some older Spads (A-2) and also the British BE-9 and FE-8. Both alternative aircraft designs shared one common idea: avoiding the issue of synchronization of gun fire with the revolving propeller. In the S.E. 5 project, a Lewis gun was supposed to fire through the reduction gear shaft, while it was ahead of the pilot and engine on the FE-10. It was seen from the beginning that the FE-10 was a very complex in terms of construction and technology. It portended cooling problems (engine covered by the cockpit). Also, the placement of the armament in front of the pilot was not safe, as was evidenced by experiences with the FE-8 and BE-9, for the possibility of injuring the pilot with the heavy mass of metal that the gun turned out to be in the case of even a “light” overturn. Another threat was the 35-gallon fuel tank positioned under the engine. For these reasons it was decided not to pursue this project further but stick to the classic design, which offered greater technological flexibility of the assumed large-number production. The power plant issues The most popular aircraft engines of the time were radial “rotary” ones, in which the bank of cylinders spinned in unison with the prop around a stationary crankshaft that attached the engine to the fuselage. This construction, designed by the Seguin brothers in 1908, seemed superb in the beginning. The absence of the water installation gave it lightness, i.e. an unusually low power consumption, whereas the rotational movement of the cylinders provided proper cooling. Overheating engines were the nightmare haunting the aviators and automobile drivers of the period – it caused power drops and seizures. Now we know that it was chiefly due to the little knowledge of fuel combustion in an engine and the low octane numbers of the fuels used. These correlations were unknown then.